Like many, I have been thinking a lot about resolutions this week. Ken & I spent some time making plans for our lives this coming year and for the changes we'd like to make in different areas of our lives. This first week of 2012 thus far has been lovely in terms of resolution and change. I can feel the positive change that will take place this year if we will stick with and carry out our plans. There are so many things we can fit into a day. There are bad things, there are good things, there are better things, and there are 'best' things. What will I do while the girls nap? Will I wash dishes? Will I blog? Will I surf the web? Will I study my scriptures? Will I watch a show? Will I fold the laundry? There is nothing necessarily wrong with any of these choices. There are some that would be better than others. And which choice is best could depend on the day and time. But every little choice is significant. A bad habbit is formed as the result of many small choices. A good one is formed the same way. 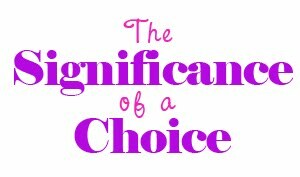 So what kind of little, yet significant choices will I make each day? Those are my thoughts this Thursday. Do you agree? Any thoughts to add? *quote from an article by Elder D. Todd Christofferson of the Quorum of the Twelve Apostles in the January Ensign called "Recognizing God's Hand in our Daily Blessings"
Thanks for commenting Emma! You make a good point about forgiving yourself when the choices aren't the best.